This topic contains 1 reply, has 2 voices, and was last updated by Themosaurus 2 months, 2 weeks ago. How can i change, add or remove items from those two menus on the profile page ? Other plugins can also add items in that menu. For example if you visit a member profile in our demo site, you will notice an “Articles” menu item. That one is added thanks to the Social Articles plugin (https://wordpress.org/plugins/social-articles/). However please note that this plugin is untested with Gwangi so we can’t guarantee that everything will work as expected, even though we believe there shouldn’t be any issues. On the other hand, the small menu displayed under the avatar cannot be easily modified and depends only on BuddyPress. This topic has been inactive for a while now so we will be closing it to keep the forum tidy. Don't hesitate to create a new topic if you still need help and we'll be glad to help you! 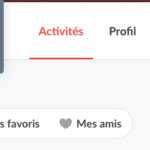 The topic ‘Profile Menu and filters’ is closed to new replies.